Musicians, songwriters and arrangers, MARI and TAKA have joined together to form TAMTAM. TAMTAM's music is characterized by crossover styles based on pop music. They incorporate traditional percussion instruments from around the world into their songs including the haunting sounds of Japanese Shinto Shrine bells, African drums. TAMTAM's aim lies in crossing all borders -- in elevating people to a new spiritual level. live both on television and radio. games), TV commercials, video and theater and Many artist supports (Live stage, Recording). MARI works for the successful International World Music Project for children. 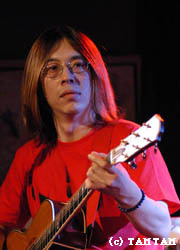 TAKA arranges music and produces CDs for Japanese pop artists. performed on-and-off stage with a number of musicians. the Power Station studio in New York. television. She hosted several radio shows and television music programs. Having been influenced by American rock music, he began playing the guitar at age 12.
professionally for musical theater companies. active in playing the guitar on the recording of their CDs. musicians and producers in Japan. well- known school of music in Tokyo.